Have you ever said “I boiled a jar to disinfect it”? Well, you were wrong. You should have used “I boiled a jar to sanitize it”. Disinfectants refer to chemical substances used to kill microbes. Therefore, something has been disinfected only if a chemical was used. Heating or irradiating surfaces are methods of either sterilizing (free of ALL live microorganisms) or sanitizing (free of most live microorganisms). 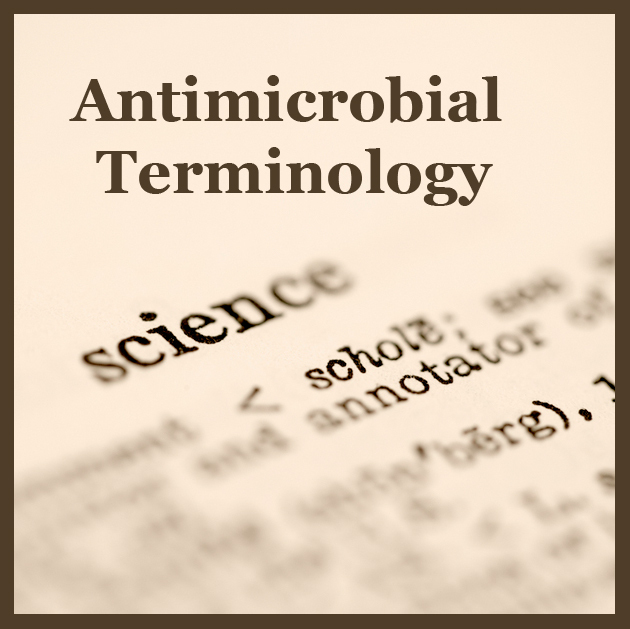 Below I hope to clarify common terminology related to antimicrobial lingo. I often come across literature (including published scientific papers) that incorrectly use some of these terms interchangeably. To complicate matters, it seems that microbiologists, pharmaceutical companies, veterinarians, doctors, industries, etc all have their own preferences about which terms they prefer to use. 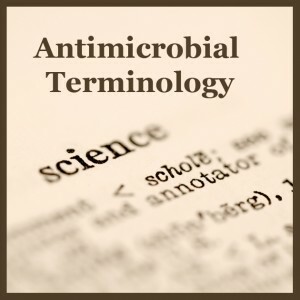 I hope this post helps with more accurate communication in regards to antimicrobial discussions. Disclaimer: This is a work in progress! The below definitions are my educated interpretation of many other running definitions out there. I need your help: I still have yet to create a functioning definition of germicidal. I cannot figure out if bactericide and biocide are the same things (Phrases like this confuse me: “Bactericidal Efficacy of Biocides”). Are there any terms that you still find ambiguous? Do you have a better function definition of any of the terms below that are more clear? Antibacterial: Inhibits the development and reproduction of bacteria. Antifungal: Inhibits the development and reproduction of fungi and spores. Anti-infective agent: A term used often in the medical field to describe chemicals or treatments capable of inhibiting, preventing, or killing the source of an infection. Antimicrobial: Inhibits the development and reproduction of microorganisms (single-celled prokaryotes and eukaryotes, includes bacteria, archaea, fungi, spores, and viruses). Includes all antifungal, antiviral, antibacterial, and antiparasitic agents. Antiseptic: An antimicrobial substance that is applied to living tissue and/or skin to prevent, treat, and/or reduce infection. Antiviral: Inhibits the development and transmission of viruses. Antiviral drugs taken internally are considered nontoxic to the host and target pharmacologically precise targets (ie. viral proteins or parts of viral proteins). Bacteriostatic: Prevents or suppressed the growth of bacteria, but does not destroy bacteria. It is my impression that bacteriostatics inhibit ALL bacterial growth whereas antibacterials inhibit most bacterial growth. Disinfectant: Chemical substances that are applied to inanimate objects and/or surfaces to kill microbes (includes all bacteria, archaea, and fungi). Examples: mercury dichloride, phenol. Disinfectants do not necessarily kill bacterial spores. Fungicide: A chemical substance used to kill or destroy fungal particles. Microbicide: A chemical agent that is used to kill bacteria, fungi, and viruses. Preservative: An additive to products (food, cosmetics, etc) used to inhibit the growth of microorganisms. Sanitizer: A method or chemical used to clean surfaces, which inadvertently kills some microorganisms, but not all. Sterilizer: A method or chemical used to free surfaces of all live microorganisms. Sterilization does not necessarily destroy prions. Viricide: A chemical agent used to deactivate or destroy virus particles. Feedback is much appreciated! Thank you! I would restrict the term “disinfectant” to killing pathogens — at least in the environmental engineering field, that seems to be the common practice. Sterilize means everything. Most of these terms have historical uses and cannot be thoroughly defined absent that history. Germicidal is something that kills infectious particles moving through the environment between people – ‘germs’ of disease. Similarly, disinfect is to remove the potential of causing infection from a ‘fomite’ (a physical item contaminated with infectious material). Disinfectants are chemical agents used to disinfect. This gets even more tricky with the bacteriocin naming conventions, for example.